Wilson’s Country are passionate about potatoes! They supply branded and own label pre-pack potatoes to retailers across Ireland and also a full range of peeled and chipped potatoes to the catering sector in Ireland and GB. Wilson’s also supply a range of convenient potato products under the ‘You Say Potato’ brand to retailers across Ireland, in GB and as far afield as Hong Kong. Wilson’s Country has a long and proud tradition, started by Angus Wilson on his home farm in Co Armagh, serving a small section of the rural community. Over the years the brand and range has evolved by continually listening to customers and offering potatoes to suit everybody’s needs. Wilson’s work closely with local growers to ensure the varieties and crops selected suit the local tastes. More recently the company have launched an innovative new brand – You Say Potato – aimed at customers who still want tasty potatoes but in a more convenient format. 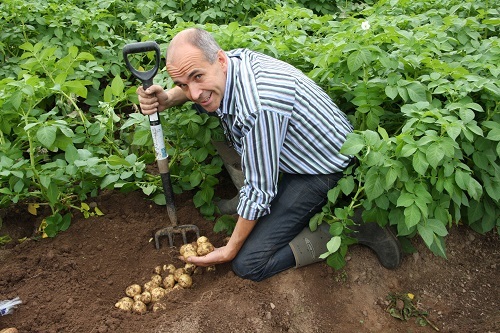 Seasonal ranges of pre-pack potatoes including Garden, Baby New, Bakers, Kerrs Pinks, Maris Piper, Navan, Queens, Comber, Organic and Rooster. Also microwaveable packs of raw potatoes. Sizes from 400g – 2kg. Convenience retail range includes peeled potatoes, chips, diced potatoes and wedges.